From the 1st of July 2005 the Driving Standards Agency (DSA), will no longer accept the D441 form as proof of entitlement to drive. If your driving test is booked beyond this date make sure that you have both parts of your driving licence available, you should check at least four weeks prior to your driving test. If you do not have both the Photocard and the paper Counterpart licence, you will lose the test and the fee. This measure is being introduced to prevent fraud. The Theory Test is a computerised test usually taken at the centre nearest to your home. There are two parts to the Theory Test, a multiple choice test and a Hazard Perception test. You have to pass both parts to obtain your Theory certificate. 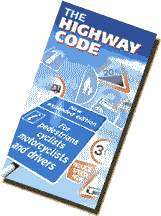 The Driving Standards Agency (DSA) recommend that you study the Highway Code, The Driving Manual and Know your Traffic Signs (all DSA publications). They also publish The Official Theory Test for Car drivers and Motorcycles which lays out the whole bank of over 1000 questions and gives advice on why certain answers are correct. Multi-media CD-ROM's are also available on the market and can make the whole learning process that little bit more interesting. To cover the Hazard Perception part of the test there is a 'Roadsense' video and DVD also available from the DSA. contains 35 questions that will test your knowledge of the theory of driving, in subjects including; car control skills, stopping distances, adverse weather conditions, motorway rules, road procedure, traffic signs and signals and pedestrians. You will have 40 minutes to answer all the questions before you move on to the hazard perception element of the test. You must score 30 out of 35 to pass this test. You have to pass both the theory and hazard perception test at the same time in order to take the practical driving test, if you fail either part of this test then you will have to take both parts again. Most questions will only require ONE answer out of four possible answer options. To change your answer simply select a different answer. Some of the questions will ask for TWO or more answers from a selection. To change your answer(s), click again in the answer selection box to deselect the answer and then select your revised choice. Some of the questions will show you a picture to test your knowledge of traffic signs, or to test your ability to recognise a hazard. Look at all the questions carefully before selecting the answer(s) you think are correct. This test consists of 14 video clips where you have to identify developing hazards. 13 of these video clips will contain one scoreable hazard, 1 video clip will contain 2 scoreable hazards. The maximum score on each hazard is 5 points. There may be several other hazards on each clip however, you wont be losing marks if you click on the wrong hazard, you will be marked down if you miss the developing hazard or fail to click on the scoreable section of the clip. The best advice available is to click when you identify a hazard, if the situation changes then click again. Your Progress instructor will help to develope your hazard perception skills. You must score 44 out of 75 available points to pass this test. We are on Passion-4-Driving Schools. The Internet Top 100 Driving Schools Websites Directory. If we do not cover your area, why not search here for an instructor near you. The practical driving test for learner drivers: Before you arrive at the test centre make sure that your car is insured for the purpose of the driving test, some hire cars are not covered by suitable car insurance. You should also ensure that you have your driving licence, photographic ID, and your theory test certificate. Your car should also be fitted with an additional rear view mirror for the examiner to use. During your driving test you are allowed to have up to 15 minor (driver) errors, you are allowed no serious or dangerous errors. Three minor errors of the same type equate to a serious error and therefor a fail would be recorded on the marking sheet. CHANGES TO PRACTICAL DRIVING TESTS! From 1 September 2003, all driving test candidates will be required to answer two questions concerning the operation and maintenance of their vehicle, one explanatory and one demonstrative. This has become known as the, 'Show me, Tell me' section of the test. Your Progress driving instructor will prepare you fully for this part of the driving test. If you are having difficulties with this section of learning or if you have any other driving queries, please, send us an email and we will find the answer to your question and reply to you as soon as possible, whether or not you are learning to drive with us.